So many website and Blogs are providing Study materials for SSC CGL Exam for free but none of them are offering you Free Online Test for SSC CGL Tier 1 . They are charging a decent amount for Online Test. My motto behind starting this blog was to help SSC Apsirants in every possible ways. 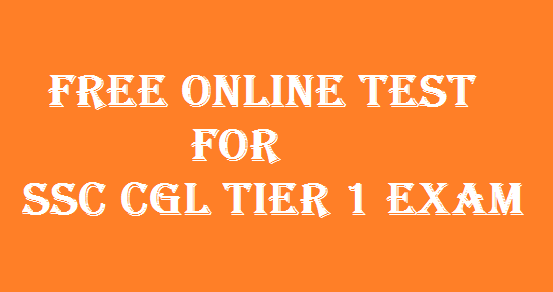 Today I am providing you a Free Online Test for SSC CGL Tier 1 Exam . This test contains 200 questions(each carrying 1 marks with 0.25 negative marking for one incorrect answers). You will get 2 Hours for solving these questions. This is our First Online Test for you. I will keep adding more tests so stay tuned. Participate in this test and check your preparation level. After the completion of test, don't hesitate in sharing your marks. I will keep adding more test so stay tuned.